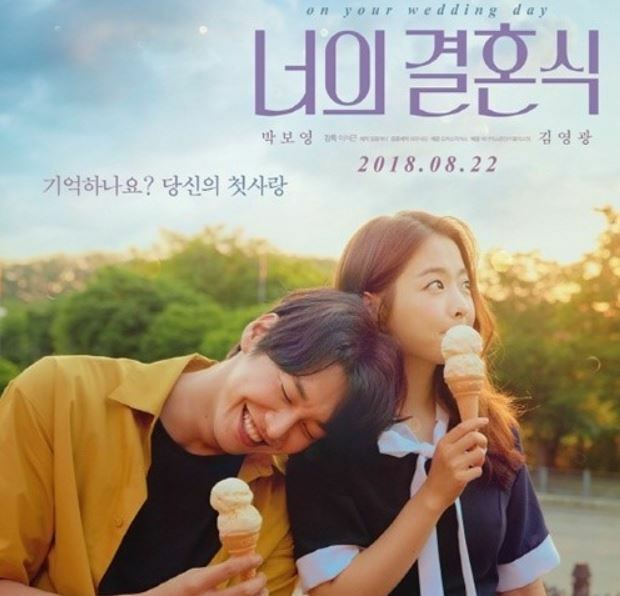 A classic boy-meets-girl drama starring Park Bo-young and Kim Young-kwang will hit theaters next month, as producers of “On Your Wedding day” confirmed Aug. 22 as the opening date. A poster and a trailer for the romantic drama, directed by Lee Seok-geun, were released earlier in the day. The film centers on Seung-hee -- played by Park -- who believes in true love at first sight, and Kim’s character Woo-yeon, who believes Seung-hee is “the one.” It will follow various stages of their relationship in their youth. “Do you remember your first love?” reads a phrase on the poster, indicating what kind of movie it will be. It marks the second time the two leads are starring together after “Hot Young Bloods” in 2014.